One of the first things you need to know about washing a horse is that it’s almost never necessary. Even if your horse is covered with mud, it is preferable to wait until it dries and give him a good brushing than to wash him. If you are going to wash your horse, you should only do so in very warm weather or if you can bathe your horse indoors and heated barn and keep him indoors during cold weather. Some horses have skin conditions that require bathing, otherwise, the only real reason to wash a horse is to prepare him or her for a race or show or parade. Even so, a good dry grooming will probably suffice. Having said that, in this article we will review some of the steps you should follow to give your horse a wash if that does become necessary. Read on to learn more. 4 What Tools Will You Need to Bathe Your Horse? 5 What Should I Use To Wash My Horse? 6 How Often Should I Wash My Horse? 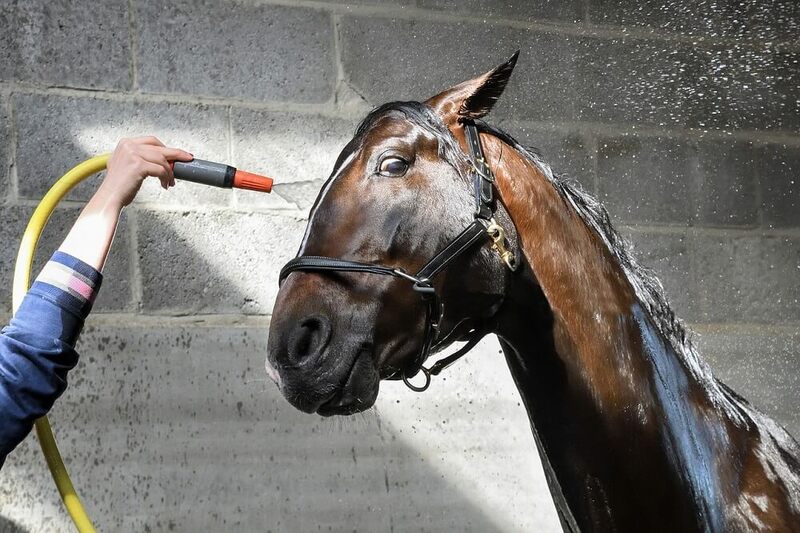 Being bathed is not natural for a horse, and if you do not have a good working relationship with your horse he is likely to be quite startled by the process. Begin by establishing a solid, predictable, every day grooming routine so that you can get to know every inch of your horse and he can become used to being handled all over. It’s always a good idea to start grooming at the head. Begin by currying your horse from neck to rump on one side and from neck to rump on the other. Follow-up by brushing with a softer brush, such as a mud brush or a body brush. Again, begin at the head and work towards the hips. With a softer brush you can also brush the legs. Switch to a very soft brush or cloth to clean the face and ears. If your horse acts up over this, you may wish to try aromatherapy by putting a few drops of oil of lavender on the palms of your hands and allowing the horse to inhale. A few drops of oil of lavender on the cleaning cloth and applied around your horse’s nose may also help. Be careful not to get the oil in the horse’s nose or eyes. Work slowly, calmly and methodically to soothe your horse and get him used to this handling. Brush your horse’s mane and tail with a stiff brush and follow-up with a wide toothed comb. Be sure to remove any bits of straw, grass or other foreign material from the mane and tail. Finish up your dry grooming by lifting all of your horses hooves and cleaning them with your hoof pick. Wipe off the exterior of the hooves with a damp cloth. If you are not planning to bathe your horse at the moment, go ahead and apply some hoof dressing to the exterior of the hooves if you wish. If you still think your horse needs to be washed, be sure that he is securely tied to a sturdy object with a safety knot so that you can release them quickly if you need to. If you have the ability to cross tie him, that’s an even better option. Depending on your resources, your physical abilities and your horse’s temperament you may either wash your horse using a bucket and a sponge, use the hose or use a combination of these two methods. If you’re going to use a bucket and a sponge, fill the bucket with warm water and wet the horse’s hair a section at a time. Follow the same order you use when grooming: upper neck first, body, legs and feet, mane and tail. You’ll want to wash, shampoo and rinse individual sections one at a time rather than attempting to get your horse wet, shampoo the whole horse and then rinse the whole horse if you are using a bucket. Be sure to rinse all of the shampoo off section by section by pouring from the bucket or by using a big sponge. Wash your horse’s face and ears with a clean, damp cloth – no shampoo. Here’s a good demonstration of washing a horse with a bucket. If you’re using the hose, put it on a medium flow and wash in the same order that you groom. With the hose, you can wet the whole horse (except for the face) and then apply a diluted solution of shampoo over the whole neck, body, mane, tail and legs. With either method, use your hands to work the shampoo into the hair in a circular motion. If you’re using the bucket method, you can If you’re using a hose, you can simply rinse the horse from head to rump and down the legs. No matter which method you use, wash the face and ears with a damp washcloth, no shampoo. Here’s a good demonstration of washing a horse with a hose. Be advised that the first thing your horse will want to do after his bath is roll in the dirt, so you’ll want to prevent that. After you bathe your horse, slick away as much of the moisture as possible using a sweat scraper. Follow this up with a big fluffy towel. If it’s a warm, breezy day you may wish to walk your horse in the sunshine for 10 or 15 minutes to help him dry off. You may also need to leave your horse cross tied or put him into a clean stall until he is completely dry. What Tools Will You Need to Bathe Your Horse? You will also need an assortment of soft, clean cloths and at least one large towel. You may also need some oil of lavender. Be sure that you have a strong, sturdy halter on your horse and a good strong lead rope to tie him with. Make certain you tie him to a sturdy, stationary object such as a pole sunk in concrete or a good-sized tree. What Should I Use To Wash My Horse? There are lots of commercial horse washes and conditioners available at your local feed store and online, but these are not absolutely necessary. A good gentle shampoo, such as a baby shampoo will work well on your horse. Diluting it in a bucket of water is a good idea to be sure not to leave soap residue on your horse. Be certain to rinse your horse thoroughly after applying any shampoo. You may wish to apply conditioner to your horse’s mane and tail to detangle and smooth it, but this is not absolutely necessary. You can use a conditioner prepared especially for horses, or use a conditioner prepared for babies. If your horse has very sensitive skin, you may wish to simply rinse him off with water. Rub him with your hands, rinse him and dry him as described above. Alternately, you can use a mixture of baking soda and water to wash and follow up with a mixture of white vinegar and water. This method cleans, softens and smoothes the hair and balances the pH level of the skin. Be sure to rinse both of these products off completely as well. To use the baking soda and vinegar method, put about a cup of baking soda in a 3 gallon bucket of warm water and stir it up until the baking soda is dissolved. Sponge this mixture over your wet horse (including mane and tail) and simply stroke or lightly curry it into the hair coat. Use your mane comb or your fingers to stroke the mixture through the mane and tail. Rinse your horse thoroughly with clean water and follow-up with a 3 gallon bucket full of warm water and a cup of white vinegar. Pour or sponge this over the entire horse including mane and tail. Again, comb and stroke the mixture into the hair coat and the mane and tail. Rinse your horse very thoroughly. Follow up by drying your horse as described above. The baking soda mixture will lift all dirt from your horses hair coat, mane and tale. The vinegar mixture softens the hair coat and mane. How Often Should I Wash My Horse? Washing your horse can strip the skin of oils and this is detrimental to your horse in a number of ways. It’s bad for the skin, and it can even interfere with your horse’s ability to regulate his temperature in hot or cold weather. It’s best not to wash your horse more often than once a month. In reality, unless you have a special event to attend or your horse has a skin condition that requires bathing, you are best off not washing him at all. Regular, daily dry grooming promotes a good relationship between you and your horse. More to the point, it gets rid of all the dirt on the hair coat, stimulates good blood circulation in the skin and leaves your horse looking gorgeous and shiny.